Garwang Sangye Dorje aka Phulung Sangye Rinpoche or Phulung Tulku Sangye was a Nyingma and Kagyu master and a teacher of Dudjom Rinpoche. From him, Dudjom Rinpoche received the empowerments, transmissions and pith instructions of the entire terma of Rigdzin Düddul Dorje and in particular the lineage transmitted through Rigdzin Düddul Dorje’s son. 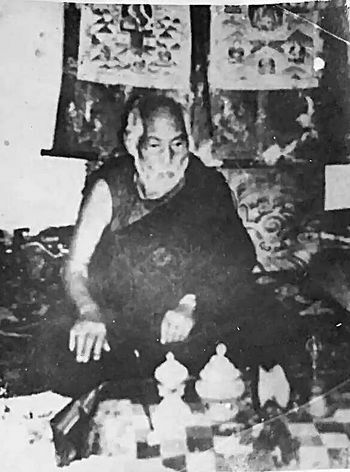 Around the 1960s, Garwang Sangye Dorje left Tibet and spent time in Pemakö, taught and practised with Togden Kunzang Longrol in Deden Tashi Chöling. Garwang Sangye Dorje passed away in India, and his kudung is in Orissa. His reincarnation has been recognized as Tulku Namgyal Dawa Rinpoche, a son of Shenphen Dawa Rinpoche. ↑ Khenpo Tsewang Dongyal, Light of Fearless Indestructible Wisdom: The Life and Legacy of H.H. Dudjom Rinpoche, Snow Lion 2008, page 90. This page was last edited on 4 September 2016, at 19:44.